Grouchy but lovable brand created for a traditional old letterpress shop. The Graphic Touch Printing Company had been around under different names and ownership since the 1930’s, faithfully serving local customers in the small town community of Salem, Ohio. At the dawn of the 21st Century, the location and competition from new digital printing services made business scarce. The well-worn shop floor was lined with amazing antique machines but they were of little use with no foot traffic coming in the door. Apple computers and desktop publishing had literally taken a bite out of the local commercial printing market. 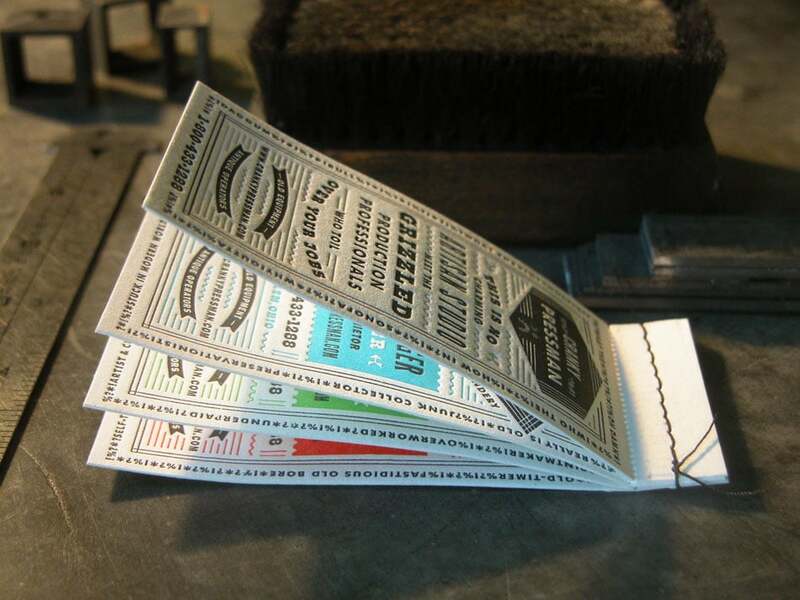 But, the finished products these gizmos spat out didn't compare with the tactile appeal and beauty of letterpress. 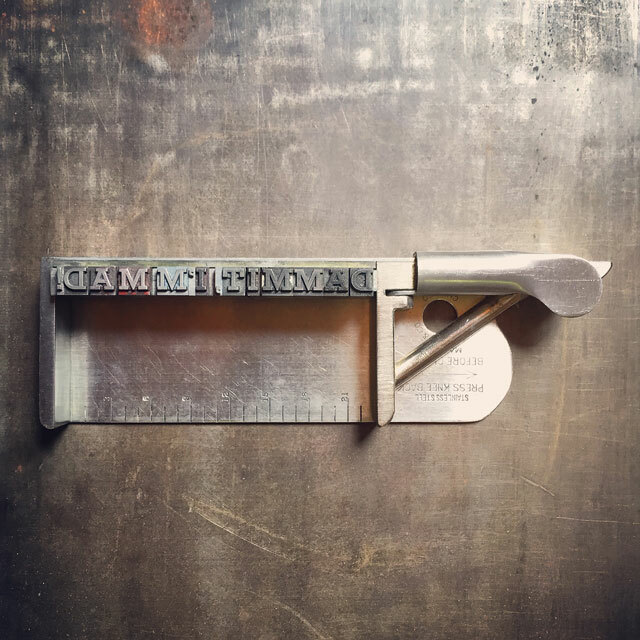 We believed that authentic letterpress printing never really went out of style and had a sneaky feeling the classic technique was about to make a comeback in an over-digitized modern world. 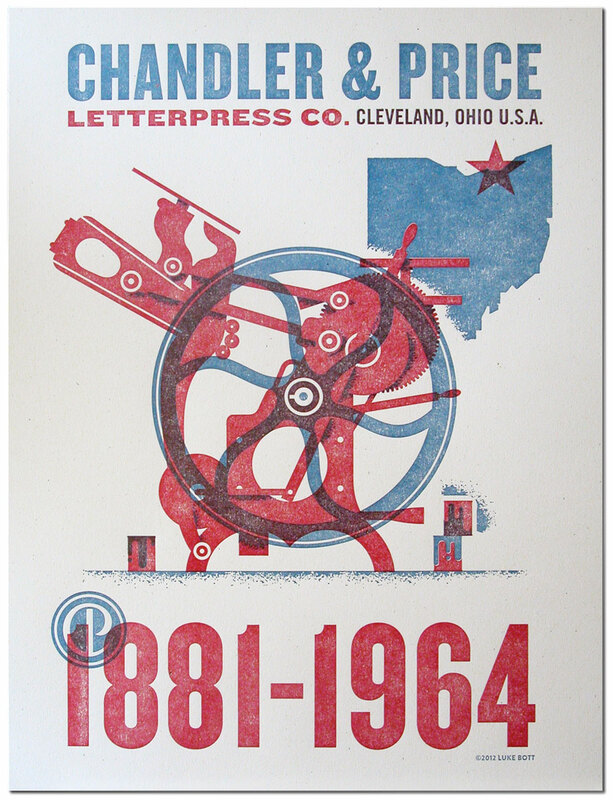 Work began around the year 2000 to convert the printing business to a dedicated letterpress shop. There was however, one piece of new technology at the time we knew would be a helpful addition to the old workshop. The internet would allow us to take the ancient craft to eager new audiences everywhere throughout the country. Cranky Pressman was born in 2003 and has grown ever since. Printers, especially the press operators, were known to be less than friendly and even hostile towards the know-it-all art directors and graphic designers they were employed to produce work for. On-sight printing press checks by creative professionals were often an unpleasant experience for all parties involved. 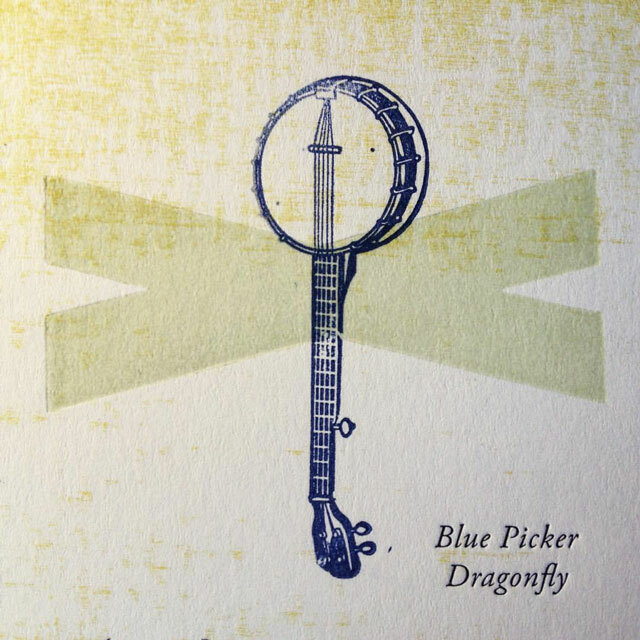 Our concept takes this crotchety personality and turns it into a brand persona for the old letterpress shop. A tongue-in-cheek, bitching and moaning tone of voice and suitably blunt retro graphics are used online, in social media, packaging and stationery. The customers often tell us how much they enjoy our branding. Mr. C. Pressman has some issues with the internet and shares complaints in a letter to potential customers. Detail from circa. 1950's something Cranky Pressman letterhead. The crank letter set contained more than just strong words. Cranky goes off the deep end with enclosures including a faux newspaper clipping from 1994. An old clipping parodying a local newspaper opinion column, said to be written by C. Pressman in 1994. In it he forewarns of the pending danger the internet is creating. Cranky likes to do things the old fashioned way and doesn't understand these new Instagram filters. Enclosed with the letter was a crap photographic print with his opinion clearly added in indelible ink marker. Cranky Pressman uses hastily scrawled further notation and outdated proofreader's marks to correct mistakes made while is his rage. Pressman does not understand nor appreciate the proliferation of cat images on the world wide web. Besides being somewhat stuck in the past, the Cranky Pressman also shows a nerdy fascination with Ohio's aviation history. 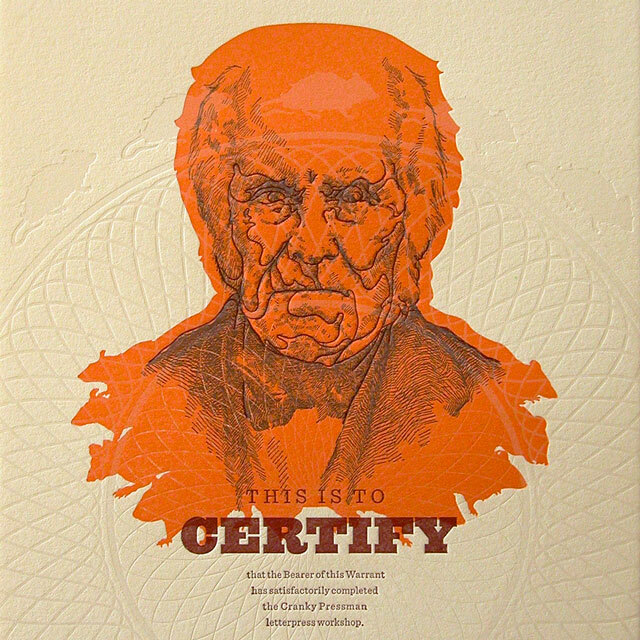 The outer envelope piece received the stamp of approval from The Ohio Camber of Cranky Old Geezers. 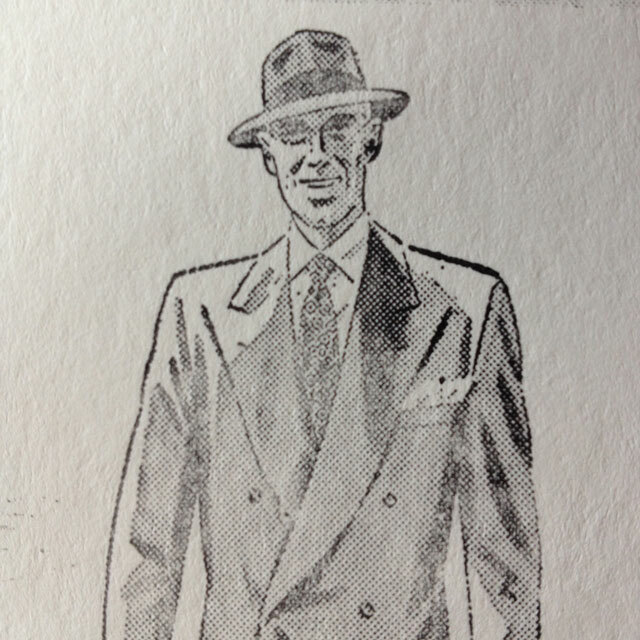 Design details included 1950's styled airmail envelopes and the pressman's inky and possibly incriminating fingerprints. Crank Letter from Mr. C. Pressman. 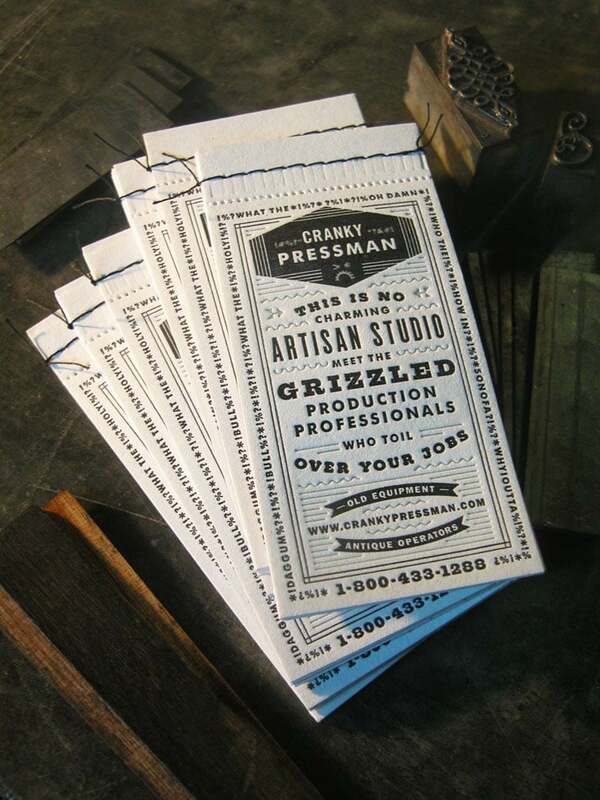 Cranky Pressman is a commercial letterpress printer with a grumpy old-fashioned brand image. He begrudgingly serves the graphic design and advertising industries. Like everyone nowadays, most of the shop’s business and marketing takes place on the internet. It occurred to us that the two made strange bedfellows. 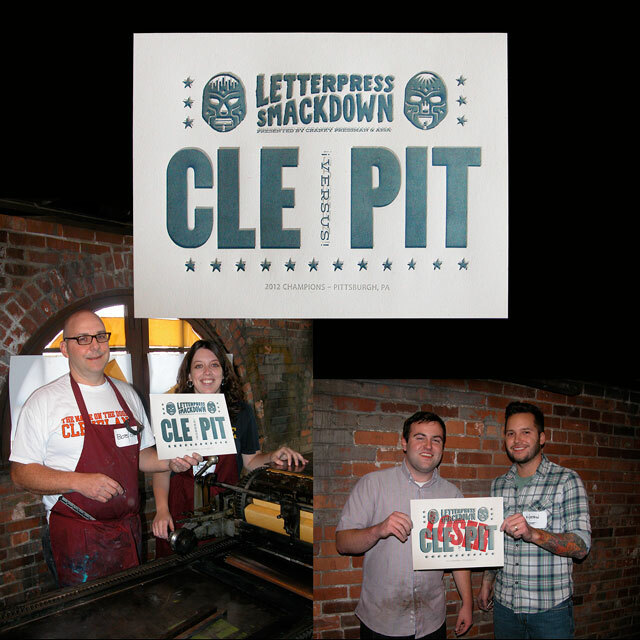 Letterpress has seen a revival in recent years, something even the pressman can smile about. The problem though, is many younger designers and art directors (along with some not so young) don’t have the experience or knowledge of working in print media. This made us wonder how the old pressman might respond to the situation. He’d definitely have a thing or two to say. But how would he express his displeasure? He certainly wouldn’t tweet about it. 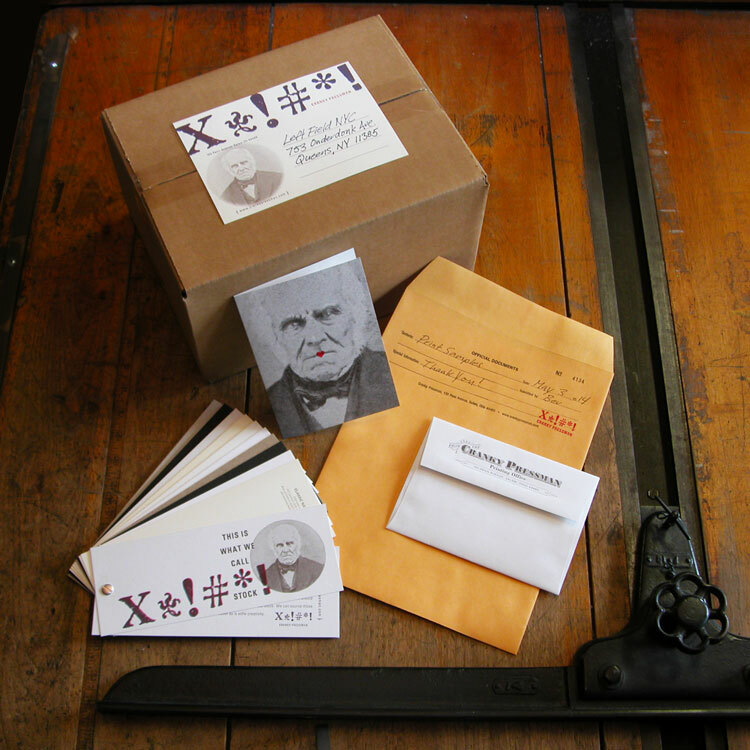 A crank letter seemed like the perfect vehicle for the Cranky Pressman to air his grievances. First and foremost it involved print. Plus, a letter of complaint requires direct mail, an important form of business communications that Mr. C. Pressman believes is overlooked of late, mostly due to the onslaught of the world wide web. We wanted the piece to be eccentric and even a touch mad. At the same time we felt the message had to be relevant and promotional. Read the letter and article here. Printed Promotions and Graphic Products. 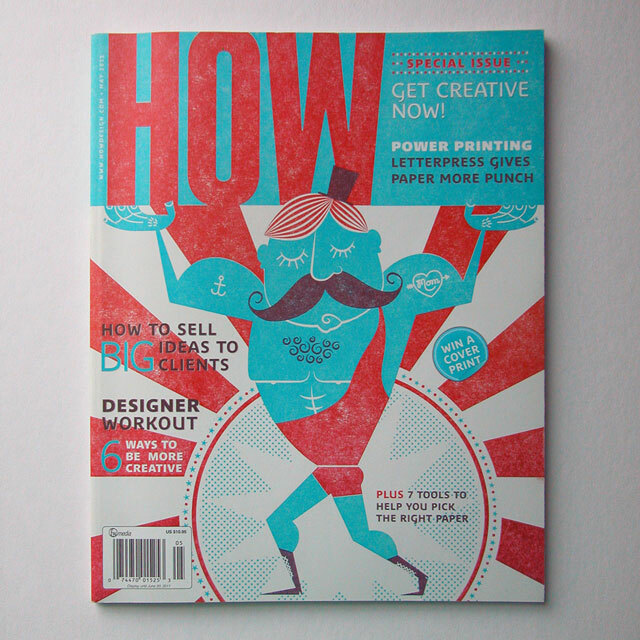 Printmaking art and graphic design are a natural part of the printer’s marketing toolbox. 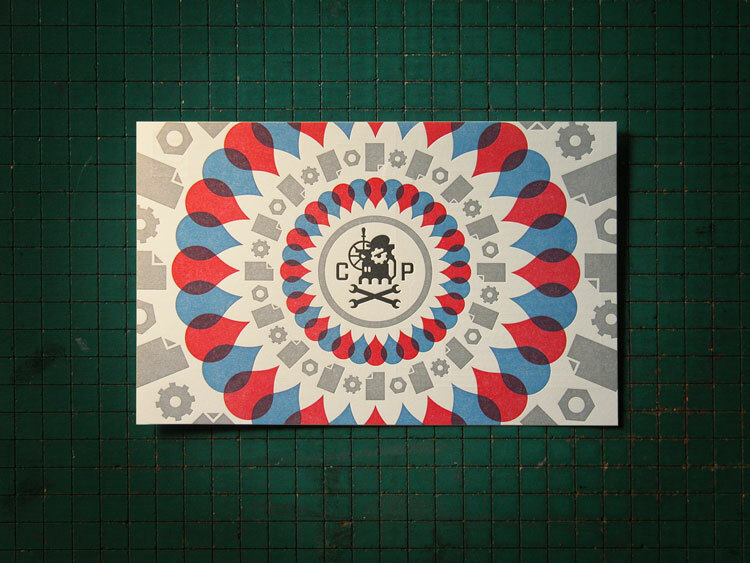 Crafted print also gives the workshop and their creative friends an opportunity to show off. Print and U.S. Mail are an effective way to spread the disgruntled pressman's word. Small art prints, postcards and multi-piece mail shots are fun to receive and inexpensive to produce. 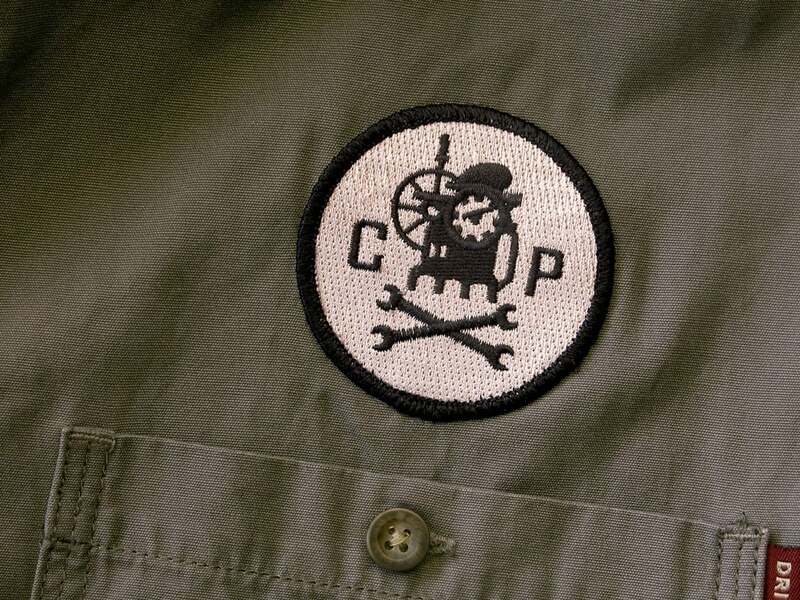 Crankily branded clothing and alternative media make good promotional swag for the old boy. This also creates opportunities to extend the brand into other areas including consumer products. 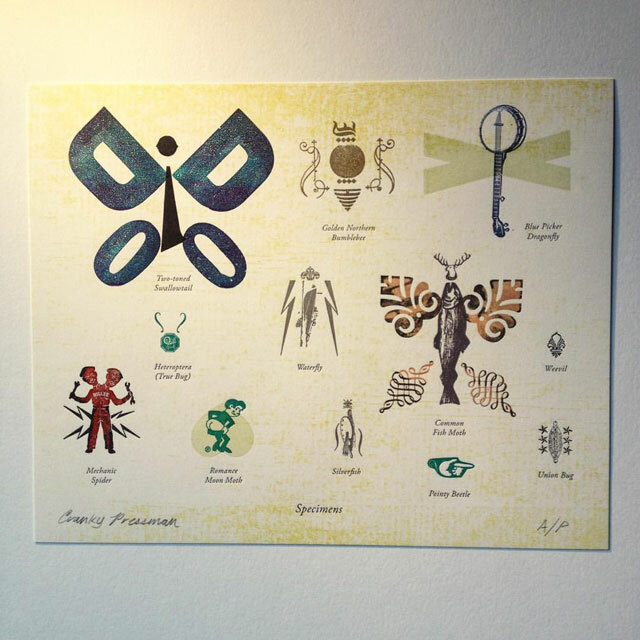 Graphic pieces demonstrate printing services to potential customers. These in turn give the printing business new products and services to sell. A set of 4 fashionably old Florida friends make up the group called The Coasters. The piece was used to launch a new line of coaster shapes ready to be letterpress imprinted with Cranky's customer's projects. The shop’s custom coaster work has grown considerably. Always on the prowl, the pressman sourced a large roll of cloth printing paper similar to the labels on a pair of Levis jeans but in white. It's a fantastic material that we'll continue to promote while using ourselves. Look for new cloth prints coming soon. The old guys like to get out and about now and then (when one of their parts aren't acting up). Events and networking are an opportunity to meet young folks, eat cheese and pass out goodies. Effective business social networking should be an everyday part of the branding process. 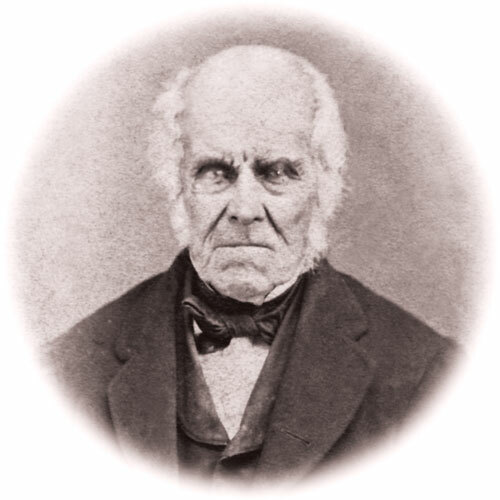 Below are a few of our favorite moments of the Cranky Pressman getting social. Being in a shop environment we like to tinker around and regularly use many different social networks. The 4 below seem to work best for Cranky Pressman's business at this time. For an older gentleman he does gets a fair amount of buzz online.